Below is our year-end report in both PDF and text formats. LUCK thanks all our supporters and looks forward to another successful year serving Cleveland’s youth. 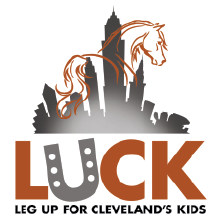 Thanks to a little help from some friends, Leg Up for Cleveland’s Kids (LUCK) was granted an expedited nonprofit 501c3 confirmation in June 2017. Since then, LUCK has strived to use available funding to serve youth in the urban Cleveland area. From 2016-2018, LUCK touched the lives of over 166 Cleveland youth despite not having a “home base.” Currently, community demand far exceeds the capacity to serve. In 2019, LUCK hopes to improve capacity by increasing financial resources and participant base. Funding support comes from a variety of areas. Foremost, our donors. Grant funding has come from the Insurance Industry Charitable Foundation and Edwin D. Northrup II Fund. We have also received generous donations from individuals both inside and outside of the equestrian community. In addition, LUCK hosted two fundraising events, including a joint fundraiser with the Cleveland Mounted Police Unit as well as a “Friendraising” event with the generous support of Topline Stables in Aurora. Without in-kind donations from trainers and facility owners, our programming would not be possible. At the end of this article, there is a comprehensive list of stables and organizations for whom we are grateful. Since its inception, LUCK has held 30 horsemanship and riding programs, providing youth with a respite from life in the city, a chance to interact with Cleveland Mounted Unit police officers, and confidence-building, hands-on interplay with horses. In addition to these programs, private lessons, skills workshops, career networking meetings, and several overnight/weekends at Red Hawk Stables have summed up the organization’s touchpoints with Cleveland kids. Youth at LUCK are exposed to real-life skills and career options. The students learn basic horse care and how to ride the horses. They are exposed to real careers within the equestrian industry; as a result, one student shadowed a braider and another had the opportunity to ride along with a large animal veterinarian. The programs provide education in the following areas: math, science, sociology, and physical fitness. LUCK established an advisory and exploration committee for the construction of a state-of-the-art urban stable to be built in a public/private partnership arrangement with the City of Cleveland. LUCK also successfully created organizational infrastructure, including website and social media presence. The board and committee members responsible for all organizational progress are entirely unpaid and work to grow and develop LUCK in addition to their chosen careers.